VEnthusiasts are always looking for good performance buys. In Europe hot hatches are the answer for many – here we like our sports cars a little different. The VW Golf R has been sold in Europe for a while, but Last December VW announced it would be sold here, at the request of enthusiasts. The Golf R is the most powerful (by six horsepower) Golf ever, and it replaces the V-6 powered Golf R20. Today VW released pricing for the car, and those looking for a really good performance buy won’t find it here – it will set you back quite a bit. The Golf R dings the cash register at $33,990 (before destination) for the three-door hatchback model. Adding a Sunroof and Navigation package will bump that to $35,490 for the three-door and a steep $36,090 for the five-door. In case you doubted the car would be geared exclusively toward enthusiasts, all Golf Rs will be equipped with a six-speed manual transmission. 4Motion all-wheel drive comes standard, and quite impressively, it can divert up to 100 percent of the R’s power to the rear wheels. In normal driving however, VW says it will “act like a front-wheel drive machine.” VW’s turbocharged 2.0-liter TSI four-cylinder is under the hood, and it makes 256 horsepower and 243 pound-feet of torque. 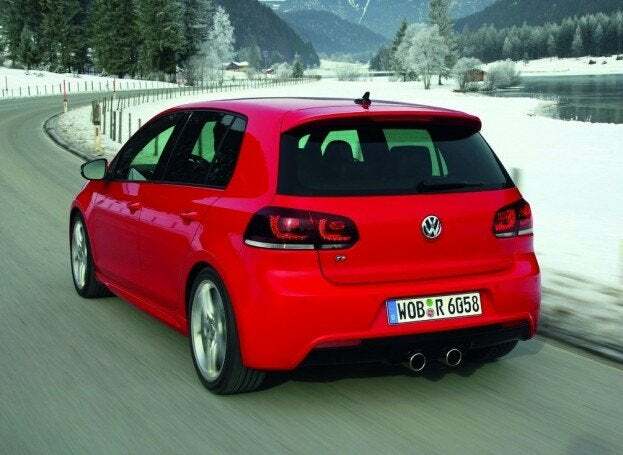 That number is up significantly on the GTI’s 200 hp and 207 lb-ft figures, and the extra power means VW upgraded the connecting rods, reinforced the cylinder block and fitted a new BorgWarner K04 turbocharger boosted to 17 psi. 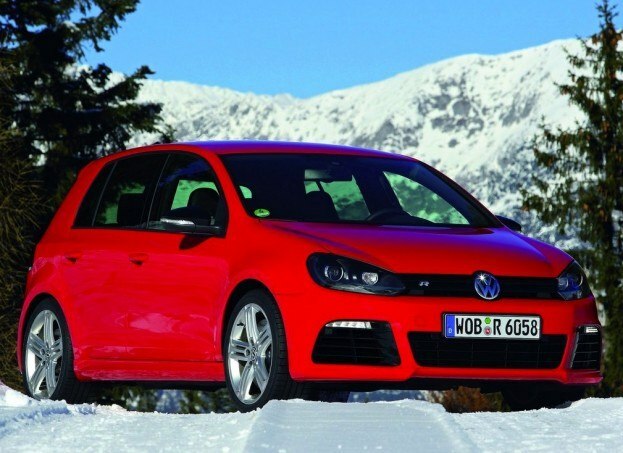 The Golf R includes a good amount of standard kit, and at its $33,990 list price it better. Things like Bi-Xenon headlights with LED daytime running lights and an adaptive front lighting system (for swiveling light around corners) are standard. Other features include Anti-Slip Regulation (ASR) and an Electronic Differential Lock (EDL). The R includes a number of visual tweaks to differentiate it from the more plebeian GTI model. Up front there is a new, more aggressive fascia with three intakes new, and a redesigned grille painted in glossy black. The brake calipers and exterior mirrors are also finished in glossy black. Side skirts and a bigger rear spoiler round out the changes, along with 18-inch aluminum-alloy wheels exclusive to the R. The Golf R doesn’t go on sale until early next year, as a 2012 model – something pretty much unheard of in the industry right now. It will be available in five colors: Rising Blue, Candy White, Carbon Steel Gray, Black, and Tornado Red. 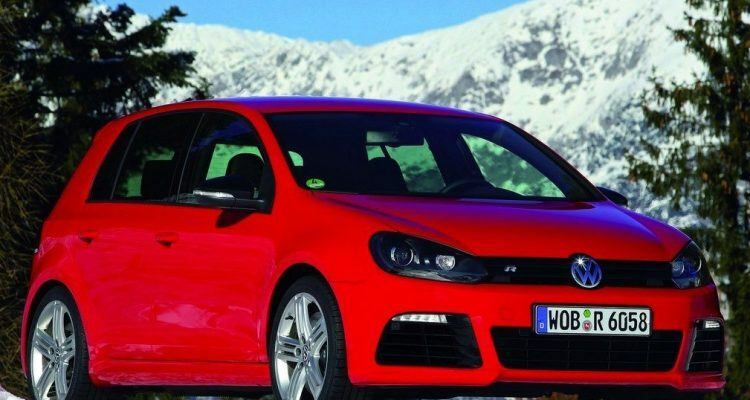 No Comments on "Volkswagen Releases Pricing For Golf R – Bargain Basement It Isn’t"